Titillated by my many miners friends, I have to try to clarify their ideas about the origin of gold. One of the first qualities of gold miners, is toughness. Obstinately they continue a journey in search of gold in the rock (originally “in place” according to terminology) in the hope of finding the source of sequins and gems they find. Clearly, this approach is the result of a dream by exploring the cave of Ali Baba who éparpillerait sparkling glitter sparingly … The story is perhaps less romantic, sometimes at least for this origin could be very diffuse. .. The clarke of gold is less than 0.05 g / tonne. Its rarity is great. We find virtually the native metal (valence 0) though gold valence 1 is known in nature (and also the state of +3 valence in the laboratory). Since its chemical reactivity is very low, we find the only metallic state (native gold) in nature. 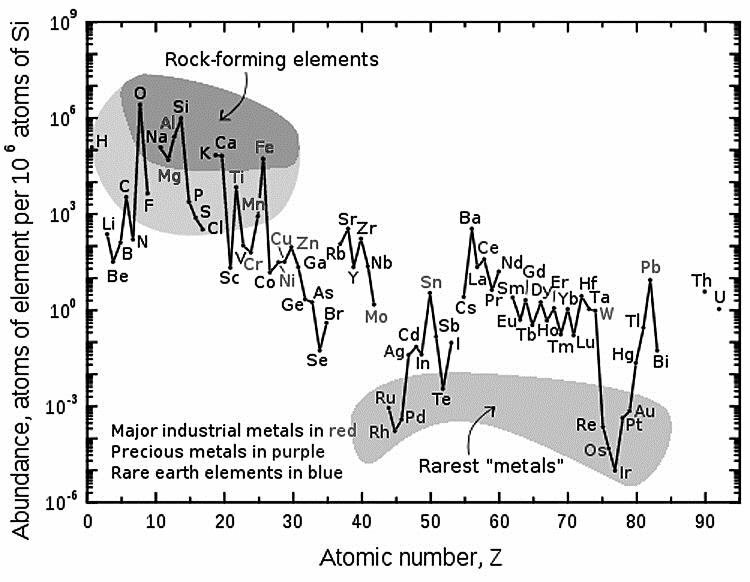 This is one of the few elements that do not exist mineral species derived, with the exception of alloys (electrum) or rare combinations like aurostibite (AuSb2) or calaverite (AuTe2). Gold actually belongs to the group of chemical elements whose character is sidérophile (iron magnet, see below). The siderophilic elements are rare in the earth’s crust. This parsimony fact that many of them are precious metals. The iridium 77Ir is the natural chemical element rarest with only a content of 1 part per billion (by weight) which is about 1 mcg / kg. We understand better how the iridium deposit that occurred after the fall of the meteorite Chicxulub could mark geologists and geochemists. It is impossible to explain endogenous origin of this layer of ten centimeters. It necessarily comes from an extraterrestrial source. Recall that separates rocks of Cretaceous and Tertiary (KT symbolized by the acronym), following the fall of the meteorite just at the end of the episode of Deccan lavas of expansion that are responsible for the great extinction species there are 65 million years. Graph showing the number of items relative to that of silicium. The lower shaded area highlights poverty Rh, Ru, Pd, Re, Os, Au, Pt and Ir (the rarest of all. Te is rare because in addition, its hydride is volatile. Extractable deposits of these precious metals are most often the result of the erosion of ultrabasic rocks. However, the deposits of these metals are not as concentrates that do suggests their abundance in the crust. Emphasize also the fact that their concentration is lower by several orders of magnitude relative to their solar abundance. It is measured in primitive meteorites, chondrites CI type. Let no way ! Where is the gold received during accretion of the Earth ? Here it is necessary to introduce some chemistry concepts. We are never escapes. In the long drift of initiation to this science, I had the opportunity to introduce the concept of mineralizing agents (chalcophile elements, greed for S) as sulfur, for example adapted to extract copper sedimentary rocks where he was disseminated. Similarly the lithophile appearance (oxygen affinity) of certain elements was highlighted to explain the genesis of tourmalines in pegmatites.